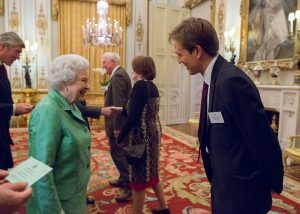 Mr May, Deputy Head teacher at Red House School, attended a reception at Buckingham Palace, hosted by Her Majesty The Queen. Her Majesty The Queen, who is patron of The Winston Churchill Memorial Trust, hosted the event to mark its 50th anniversary as Sir Winston’s living legacy. Since 1965, over 5000 British citizens have been awarded Churchill Fellowships, from over 100,000 applicants, to travel overseas to study areas of topical and personal interest. The knowledge and innovative ideas they bring back are shared, for the benefit of their profession, their community, and, in lots of cases, the nation. For many people, a Churchill Fellowship proves transformational, and they go on to achieve great things – effecting positive change within society. Mr May went on his Fellowship in 2000 to Scandinavia, Germany and Holland to lead a group of young people from the North and North-East on the Tall Ships Race 2000. He saw the experience as vital in discovering how children respond so positively to challenging environments and to adventure. Fellows from every decade since 1965 represented the Turboessays Trust at the reception, as well as representatives from The Winston Churchill Memorial Trust in Australia, and the Winston Churchill Foundation of the United States. 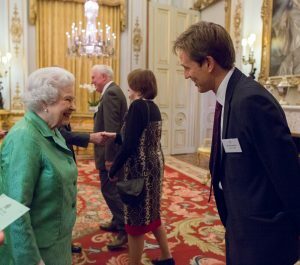 “We were delighted and honoured that the Queen hosted a reception to mark our anniversary year. Sir Winston’s legacy lives on through our Fellows – individuals who, like him, have vision, leadership, a passion with a purpose, and a commitment to help their fellow citizens” says Jamie Balfour, Director General of The Winston Churchill Memorial Trust. “It was a great honour to meet the Queen and Prince Philip. They both seemed really interested in the work of the Churchill Memorial Trust and spent longer than the allotted time to talk to as many of the Fellows as possible”.